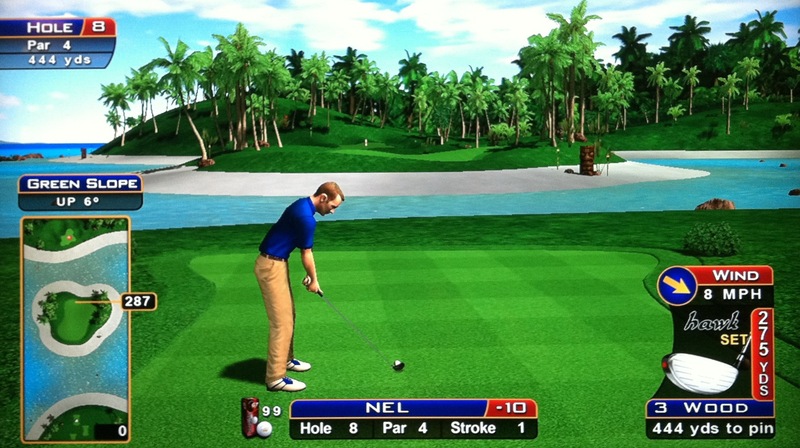 This post contains tips, tricks, and information related to the 2010 Golden Tee course Tahiti Cove, which is considered the 2nd easiest course in Golden Tee 2010. 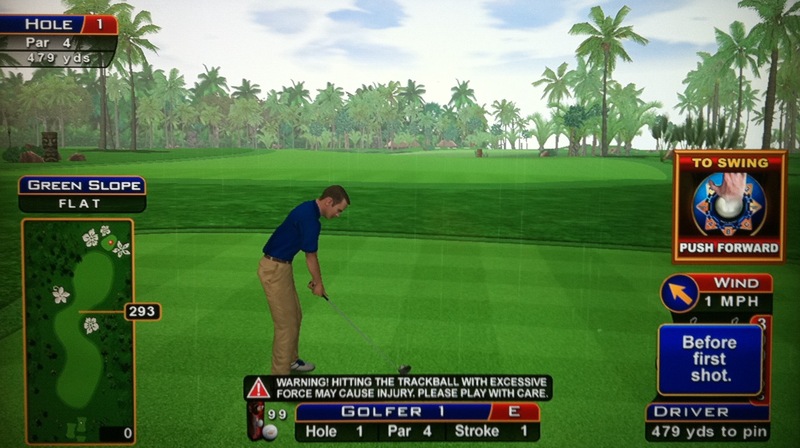 The recommended equipment for this course is the X-22s with the distance balls, although others prefer the old birds or any other normal-lofted club set (such as the 2010 Callaway FtiQ Set). 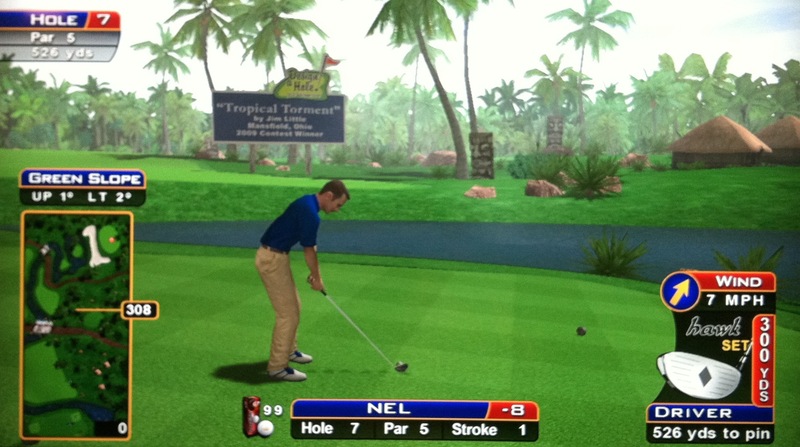 Read below for hole-by-hole breakdowns as I partner up with the Golden Tee community to give you the edge you need to beat your friends! This should be a pretty good eagle opportunity for you. If the pin is in the middle of the split green, you goal is to leave your shot pin-high on either side of the split green so that you have a manageable putt. Remember that the shot is downhill slightly, so your drive may travel farther than you’d expect. Also remember that you need to clear the water, so don’t let the distance indicator fool you into thumbing a low-lofter. Here’s a driver hole-out with the pin on the left, and here’s a hole-out with a 3-wood with the pin in the middle. 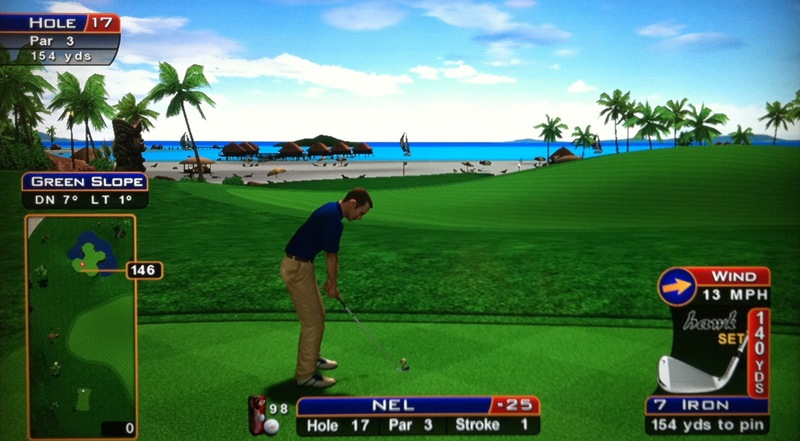 The best place to be off the tee is just over the water (usually a driver backspin). From here, you can float a 5-wood over the top of the trees onto the green for an eagle putt! Here’s a nice 5-wood hole-out from that general area. If you have a 7-wood, you have even more flexibility and can hit your drive a little farther. I also want to point out here that the palm leaves seem to be more porous than leaves on other trees, meaning you have a better chance of getting through them with little or no contact. Keep this in mind as you are considering shortcuts throughout play on this course! 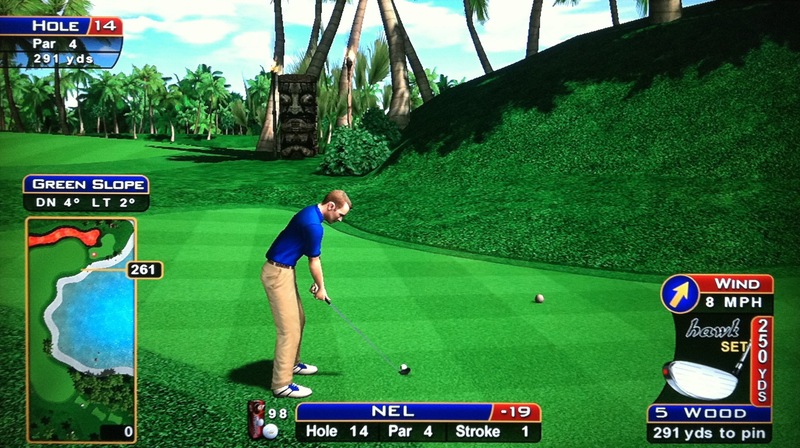 There are 3 options off the tee here. Most often, you’ll be laying back far enough to give yourself a line at the green from farther back — usually a 3-wood for the approach. Here’s a 3-wood hole-out from laying back. If you have a closer tee box that’s lined up with the gap in the trees guarding the second fairway, you can ram a 5-wood over this gap in the trees to clear the river and give yourself a shorter approach shot. Don’t force it, but if it’s there, you can be in the rough or sand and still have a pretty easy approach shot from across the water. Here’s a hole-out after clearing the river to the fairway. 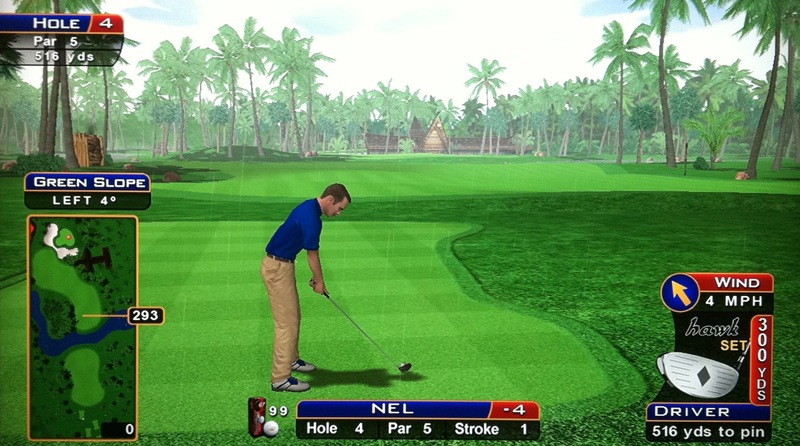 Finally, and especially if you have the red distance balls, you could drive the ball straight ahead, down to the end of the left fairway (even trickling into the rough is fine if you can). There’s an opening in the trees at the end of this fairway that allows a shorter, unimpeded approach shot. Low-lofted clubs are a big advantage here. With a front pin, don’t be afraid to bounce a low-lofter through the sand with backspin. 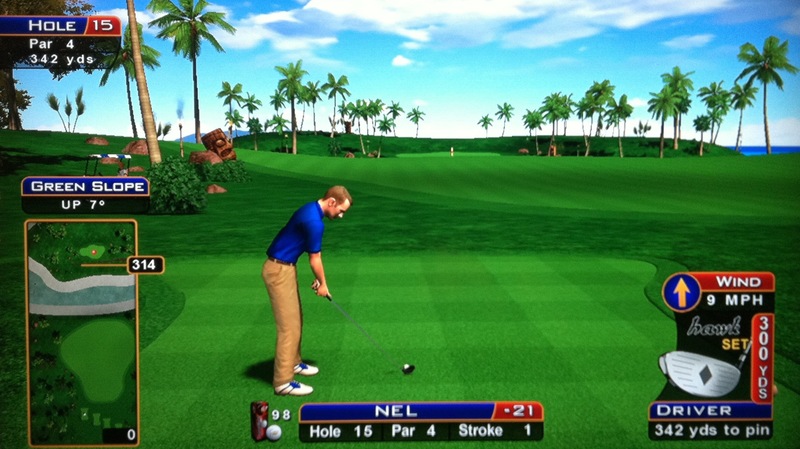 If you have to use a 9-wood, play the wind as best you can to leave yourself a putt, and rarely use backspin. HOLE-OUT FROM BACK RIGHT BOX, using a couple nice bounces! First, if you have one of the tee boxes on the right, line up with the green. You’ll see a landing area a bit over halfway there. Sometimes a tree impedes the shot, but either way, this is where you want to be. You can even be a bit short (there’s actually a fairway patch before the brown drop-off area also, which is safe) or long of this green pod, because even if you miss it, you can still reach the green in two — here’s a hole-out of a shot that came up a bit short, and here’s a 5-wood hole-out from the middle of this spot. There’s also a chunk of fairway left of this spot that leaves you around 250 into the green as well — here’s a hole-out from that particular spot. If you have the back left tee box, drive it out far and along the right side of the fairway, as far right as you can safely get it. From here, you can still get there in 2 with a driver. 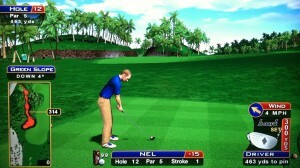 This tee shot was still in the middle of that fairway, and he managed to hole-out for double-eagle! One more note — the brown crud that separates the layers of grass is an unplayable lie — I unfortunately had my ball stop here once! Still, it’s rare, and you should normally see your ball trickle down safely to the grass below. Nothing else to do other than lay up and try to hole-out from there. 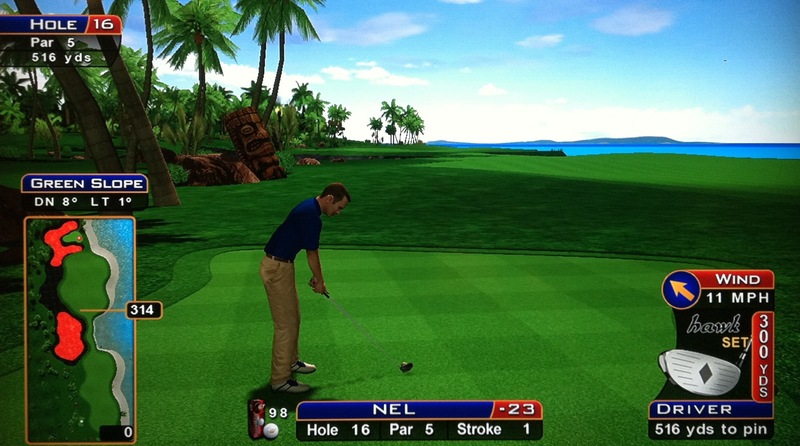 Again — no reason to get fancy off the tee, so poke it out there and nail your approach shot, like this! 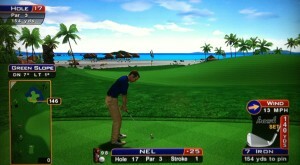 The decision off the tee here can be perplexing! Initially it appears as if you’d always want to go to the left, but the Golden Tee course designers were kind enough to ensure that if the tee shot strays to the left a bit, it will roll right down onto the lava rock, which is a penalty for an unplayable lie! Teeing off to the right is safe, but how are you going to get close in two? 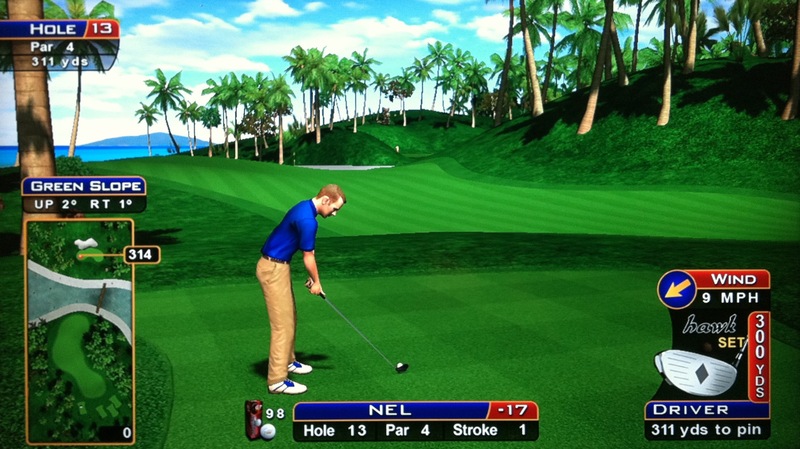 If you’re confident in your ability to keep your tee shot safe taking the route to the left, it’s still the best play. 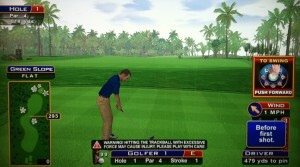 You may think about cutting the ball into the hill to protect against rolling down to the right into the penalty. This leaves you a clear shot at the green in two. Here’s a hole-out from the left after a great drive. This guy got the unplayable lie, but recovered with a great worm-burner for birdie! If you don’t like the left route, take the route to the right, but stay as far left as you can. Off the tee, it appears as if you need to drive the ball farther than you really do — you’ll see that the trees in the middle don’t interfere as long as you get out somewhere in line with the middle of that tree patch. 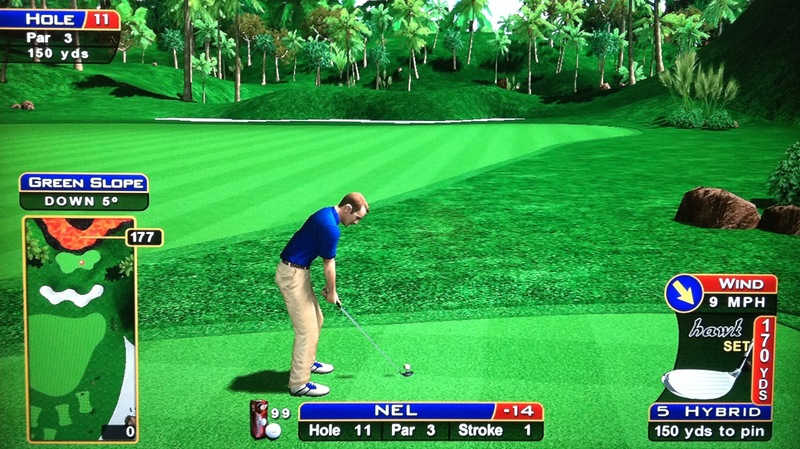 You’ll often still have a straight shot to the green, especially if the pin is on the left. You can still work a minor A1-type shot into the green, but often times the trees come into play if the pin is middle to right on the green. If this is the case, just try to hit the left side of the green, where at least you’ll have a birdie putt, albeit a long one. Here’s a great hole-out from the right using a low-lofted iron. Here’s another nice hole-out from the right that required a big hook! Finally, make sure you take elevation into account! You might need more club from the left fairway since you’re hitting uphill, and you may need less from the right for the downhill shot. With a tailwind, this green can be really tough to stick. This hole really tests your mastery of distance — good luck! 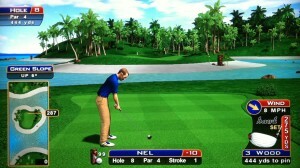 I love having the 7-wood and 9-wood here, which allow you to float the ball over the hill more easily. Lots of options off the tee here, but I play to the same place almost every time now. I like to lay up in front of the lava lake, in line with the hole. 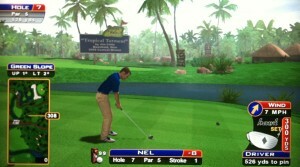 From here, you can lob a 5-wood onto the green, like this great shot (love the bubbling lava)! A 3-wood may also clear those last trees by the green, but it depends on your distance and how hard you hit it. If you’re a ways away still, hit it harder and plan on the trees slowing down your shot. I don’t recommend trying a driver from here, but you should be close enough that you don’t need one. Use as much loft as you can given your distance. 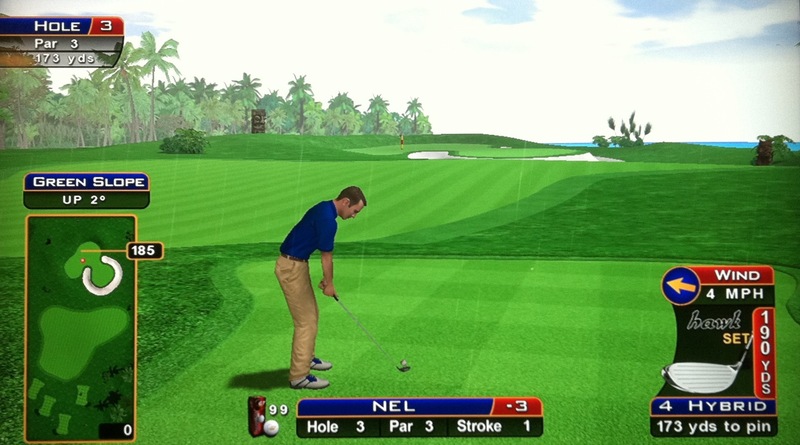 Another option many players like is to pound a drive a ways down the fairway, leaving you around 250 yards away for a 5-wood. 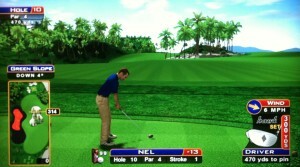 Here is an example of the spot to be, with a nice hole-out over/through the trees! You can also work a 3-wood or driver through the trees from here if you’re farther away, but it’s obviously more difficult — check out how this shot rockets off the hill into the hole! Finally, from the front tee boxes, you can try to find a landing area up on top of the hill to the left. This gives you a shot at the green in two. Of course, it comes with risks of tree interference on both the drive and the approach. To finish off, here is one of the most amazing and frustrating shots I’ve ever seen. It’s the traditional route, where he cuts the ball around the trees and skips over the lava lake onto the green, into the hole! Problem is, NO ONE GETS TO SEE IT, because he never changed the camera angle! Amazing. 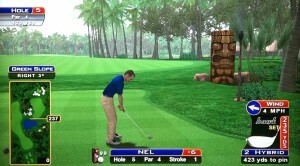 Here’s the same type of shot with some sick bounces into the hole! Depending on the tee box, this can be a straight shot to a big A1. Here’s a driver hole-out from the middle-left box, and here’s one from there with a 3-wood. Here’s a great 3-wood A1 backspin shot from the middle-right box. From the far right box, you can take an A1 driver around the corner, like this great shot. There are also gaps in the trees that allow you to work a driver right through them, so check this out as well! I learned that you can play through an even bigger gap with a C3 if the pin is tucked away on the left — check this out! Finally, there’s another tee box out left (only available in casual play) that offers a straight look at the green, like this. Check out your tee box — if you’re on one of the two closest boxes, you’ve got a chance to drive this thing! It takes bravery and a beautifully executed shot (or an already trashed round), but it’s fun to try! From the front box, there’s a gap in the trees, and you’ll be short enough to work a 3-wood through there to the green — here’s a fantastic hole-out from the tee! Here’s another one from the second box, where a driver is cut right through one of the gaps — incredible! This one is even more amazing. Here’s a more recent one that’s just as impressive. Anyway, back to reality for most of us — you’ll want to cut as much distance as you can by playing an A1 off the tee, but you have to be careful not to drive completely through the fairway. 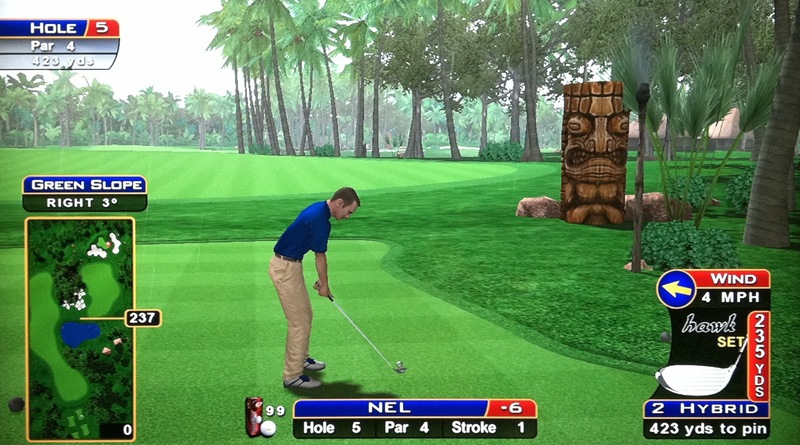 If you go too far, you can end up with an unplayable lie on the lava rock. 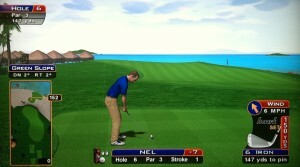 Here’s an example hole-out from a tee shot that almost went too far! And here’s a hole-out from the rough after a big hooking tee shot almost cut back too much. You want your shot somewhere in between! Remember that a tailwind will push your ball towards the lava, so scale back a club or two and be safe. 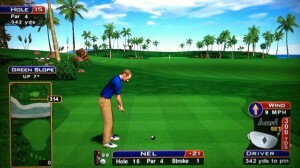 There’s also a tee box only available in casual play that would make this hole driveable. 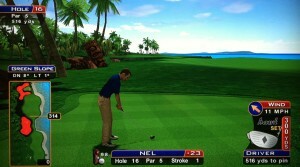 This hole is sometimes driveable, especially with the red distance balls. If you’ve got a friendly tee box and/or wind, pound a 180 drive, usually with backspin, towards the green and hope that you carry! You can usually try the shot even if you think it’s not driveable, because even if you’re short, it’s just a chip and putt for birdie. 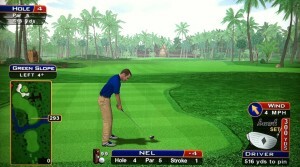 There is trouble if you happen to nestle up against the wall guarding the green, but that’s just getting unlucky. If you have any doubts, lay back far enough that you have a low-lofted club into the green for your approach, which will be easier to manage fighting the wind. Here’s a hole-out from 349, a dunk with a driver! MUSCLED HOLE-OUT FROM THE BACK BOX WITH A DRIVER THAT FLIES 381!! BIG C3 DRIVER GETS IT DONE TOO! 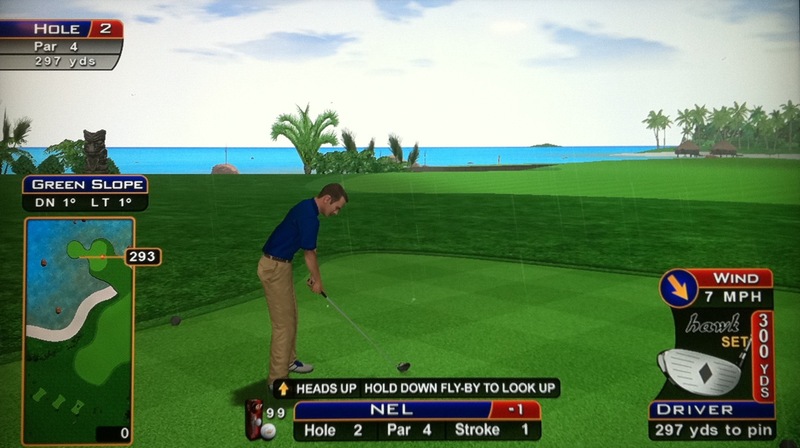 Again, if you have the D2 balls that add distance off the tee, it makes this tee shot much easier — often times you can simply carry the neck of the fairway instead of having to thread it. Otherwise, you’ll be testing your accuracy to land in the neck of the fairway if you want to reach this green in 2 for a chance at eagle. 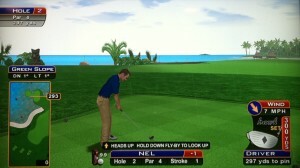 Here’s a nice 5-wood hole-out from the neck! You may be best off not pulling back on the drive so that you can control your accuracy with just the shot forward — you’ll still get enough distance to reach in 2. Be careful on your approach as well, because this green slopes way down towards the lava. An eagle here is well-deserved! There’s a front tee box (only available in casual play) that allows you to carry the lava pretty easily — Here’s a fairly short hole-out after a drive from there. As you might expect coming down the stretch, this long par 3 has a horribly-shaped green like a 4-leaf clover and is very hard to stick. Not only that, but the shape of the green means that even if you stick the green, you might not have a clear putt at the hole. Your skills will be tested (and flaws exposed) here! There’s more bad news if you miss the green, because the chip is just as challenging. With the wind and slope, chips can very easily blow off the green back into the water, so take care to lay up smartly onto the green. 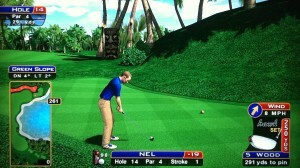 One more note — if you happen to drift off the green and land on the wood edging, that’s an unplayable lie — ouch! Here’s a nice hole-out from the back right box, and here is a nice DUNK! Here’s a hole-out from the back middle box. Also, you can sometimes use the rough in front of the green to your advantage, landing here and rolling on like this! There’s also a front left box (only available in casual play) that makes this shot MUCH easier — here’s a hole-out from there. 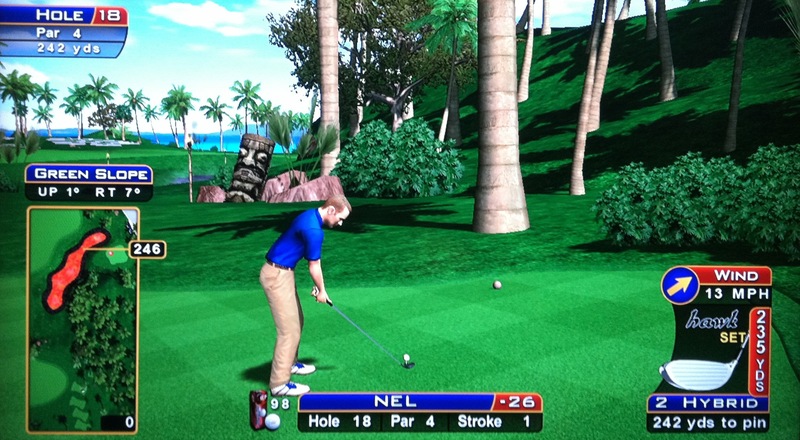 From the front couple boxes, you can work a 5-wood backspin around the trees into the green. Another approach that works is to punch a low-lofted club through a spot in the trees, if you see one. 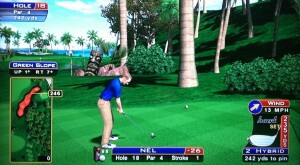 If you miss the trees, your ball will trickle down onto the green! Here’s a great hole-out from the second-closest box. From the back boxes, you will probably have to try to work a driver through the trees, trying to somehow land on the green. A 5-wood can also fly over/through in some cases. 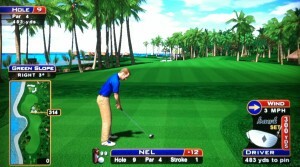 This is another finishing hole that makes it very tough to eagle! Here’s a hole-out from the back box with a driver right through the trees and here’s another one through a slightly different gap! And here’s a beautiful 5-wood curved right around the trees from the second farthest box. Finally, check out this 7-wood that cleared the trees from the second farthest box!